Amino acids in skeletal muscle: Are protein supplements as good as advertised? The data is from 18 young and healthy individuals (16 males and 2 females) after an overnight fast. The gradient is a measure that contrasts the concentration of an amino acid in muscle against its concentration in blood plasma. Amino acids are transported into muscle cells by amino acid transporters, such as the vesicular glutamate transporter 1 (VGLUT1). Transporters exist because without them a substance’s gradient higher or lower than 1 would induce diffusion through cell membranes; that is, without transporters anything would enter or leave cells. 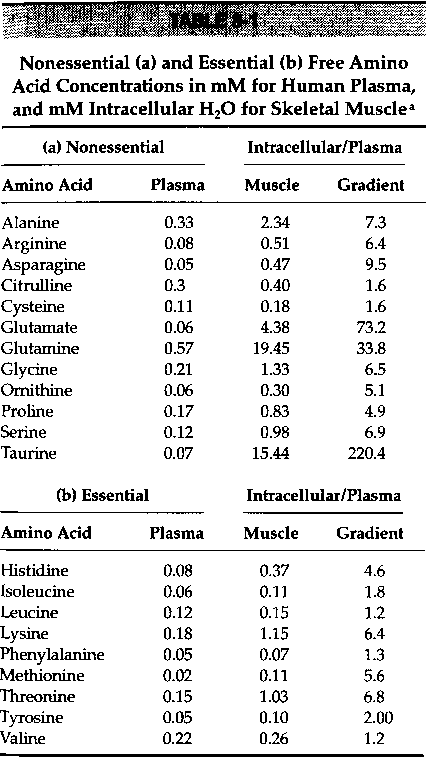 Research suggests that muscle uptake of amino acids is positively correlated with the concentration of the amino acids in plasma (as well as the level of activity of transporters) and that this effect is negatively moderated by the gradient. This is especially true after strength training, when protein synthesis is greatly enhanced. In other words, if the plasma concentration of an amino acid such as alanine is high, muscle uptake will be increased (with the proper stimulus; e.g., strength training). But if a lot of alanine is already present in muscle cells when compared to plasma (which is normally the case, since alanine’s 7.3 gradient is relatively high), more plasma alanine will be needed to increase muscle uptake. The amino acid makeup of skeletal muscle is a product of evolutionary forces, which largely operated on our Paleolithic ancestors. Those ancestors obtained their protein primarily from meat, eggs, vegetables, fruits, and nuts. Vegetables and fruits today are generally poor sources of protein; that was probably the case in the Paleolithic as well. Also, only when very young our Paleolithic ancestors obtained their protein from human milk. It is very unlikely that they drank the milk of other animals. Still, many people today possess genetic adaptations that enable them to consume milk (and dairy products in general) effectively due to a more recent (Neolithic) ancestral heritage. A food-related trait can evolve very fast – e.g., in a few hundred years. One implication of all of this is that protein supplements in general may not be better sources of amino acids than natural protein-rich foods, such as meat or eggs. Supplements may provide more of certain amino acids than others sources, but given the amino acid makeup of skeletal muscle, a supplemental overload of a particular amino acid is unlikely to be particularly healthy. That overload may induce an unnatural increase in amino acid oxidation, or an abnormal generation of glucose through gluconeogenesis. Depending on one’s overall diet, those may in turn lead to elevated blood glucose levels and/or a caloric surplus. The final outcome may be body fat gain. Another implication is that man-made foods that claim to be high in protein, and that are thus advertised as muscle growth supplements, may actually be poor sources of those amino acids whose concentration in muscle are highest. (You need to check the label for the amino acid composition, and trust the manufacturer.) Moreover, if they are sources of nonessential amino acids, they may overload your body if you consume a balanced diet. Interestingly, nonessential amino acids are synthesized from carbon sources. A good source of carbon is glucose. Among the essential amino acids are a group called branched-chain amino acids (BCAA) – leucine, isoleucine, and valine. 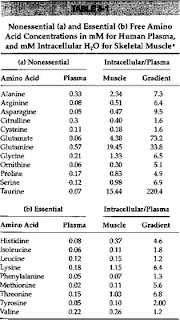 Much is made of these amino acids, but their concentration in muscle in adults is not that high. That is, they do not contribute significantly as building blocks to protein synthesis in skeletal muscle. What makes BCAAs somewhat unique is that they are highly ketogenic, and somewhat glucogenic (via gluconeogenesis). They also lead to insulin spikes. Ingestion of BCAAs increases the blood concentration of two of the three human ketone bodies (acetone and acetoacetate). Ketosis is both protein and glycogen sparing (but gluconeogenesis is not), which is among the reasons why ketosis is significantly induced by exercise (blood ketones concentration is much more elevated after exercise than after a 20 h fast). This is probably why some exercise physiologists and personal trainers recommend consumption of BCAAs immediately prior to or during anaerobic exercise. Supplements would be truly natural if they provided nutrients that mimicked eating an animal whole. Most supplements do not get even close to doing that; and this includes protein supplements.